The Citizens Leadership Academy is an annual 8 week course offered by the City of Las Vegas. I was honored to be one of the 25 Las Vegas residents chosen for this years class. I’ve still not posted our field trip to the waste treatment plant, but all the other posts I’ve written can be found here. Yesterday was my “extra credit” Ride-along with a Metro officer from the Downtown Area Command. Mary Alderman did a similar ride-along with a City Marshal the other day. I’m notorious for always being in learning mode. Ask any auto mechanic, or a/c repair guy, or anyone else that ever let me watch them do their job. I ask a million questions, and keep digging deeper and deeper with the “why”. Officer Pierre did a great job answering my 100’s of questions. I stumped him a few times in the why department, though. Our first call was a teen who got mugged and had his IPOD stolen on the way home from school at 28th and Searles. It was a real sleeper watching a report get written, but I did have an opportunity to look around in a part of town I rarely ever venture into. Way too much of it looked like this. About half the time was spent just cruising around looking for trouble. That’s my kind of job! I didn’t realize that at every stop light, most metro officers run the license plates of every vehicle in front of them. They find lots of people with warrants, stolen cars, etc by doing so. No luck last night, but I heard some great stories. 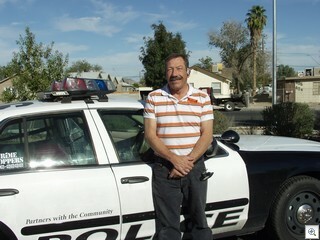 I did get to give Officer Pierre a short tour of the downtown VeryVintageVegas neighborhoods. He had no idea of the history, the housing styles or the tremendous effort that has gone into turning around these great neighborhoods. We stopped by my house so I could show Steve and JJ the police car. I’m sure there’s gossip on the street as to why I got taken away in a police car. We spent about 20 minutes looking for a BMA and WFA (that’s police jargon for a black male adult and a white female adult) who were supposedly walking down Highland Ave yelling and screaming and hitting each other. Didn’t find them, and stopped for a break. 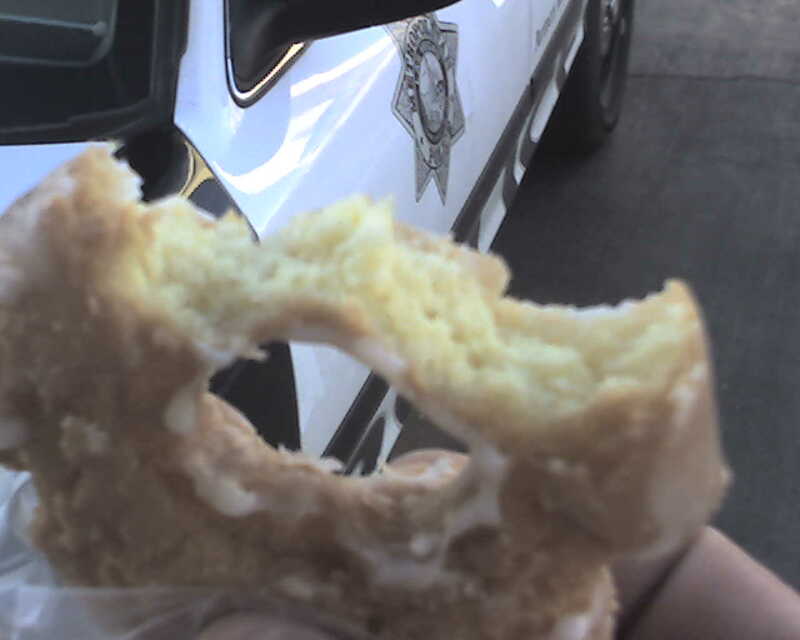 I paid homage to the “Simsonesque” stereotype, and bought a donut! Officer Pierre preferred Skittles and a Vitamin Water. We took a dispatch call to 9th Street north of Bonanza, which turned into a chit-chat with the neighbors who were complaining about the guy across the street who drives too fast when the kids are playing ball in the street. But we had to leave in a hurry because someone got shot in Naked City! Now I thought I was going to see some action. Unfortunately, we were the 7th squad car to arrive at the scene, so we didn’t get to do any interviewing of witnesses, or helping the ambulance load up the victim who was shot in the side, or any of the other exciting stuff. The FIRST car on the scene is in charge till a Sargent arrives, and there’s a protocol for major incidents like this. Helping the victims, securing evidence, interview witnesses etc. Cars 1 to 5 to arrive get to be in the center of the action. The last cars, however…. We got stuck taping off the outer perimeter a block away, and diverting traffic away from the crime scene. Bummer. After 1/2 an hour, I realized that that we were going to be stuck just sitting there doing nothing for another 2 hours or more. 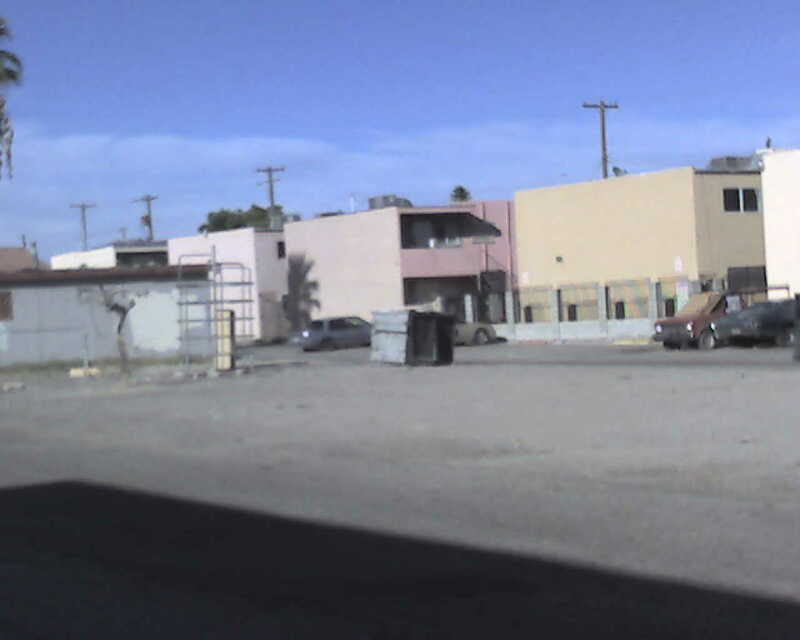 I have a real low threshold for boredom, so I started calling around for someone to come and get me and take me back to my car at the Downtown Area Command. I forgot to ask to see the taiser, and I never got to drive with the siren screaming. And worse, I didn’t get to drive the car or bust a perp. But otherwise, I had a great time.